Emperor Mazool orders his guards to open fire on Nova Posse and the Turtles. They fight back but are forced to retreat when Rave takes a laser to the face. Luckily, Zebulon swoops in with their ship and picks them all up. They decide to head back and help the Stump Armada fight the Aerwyl Fleet in space. Inside the black hole, Donatello has gone insane with power thanks to the Turnstone. Now “one with the universe”, he can see everything, everywhere and the omniscience is not only costing him his mind, but enlarging the black hole at a rapid rate. Qark, still onboard Nova Posse’s ship, telepathically communicates to Sarnath what’s happening to the black hole. At last understanding, Sarnath knows what he must do. Out in the space battle, Nova Posse takes a hit which destroys their communications panel and injures Trip. With no means of communication, and flying an Imperial ship, the Stump Armada will have no way of differentiating them from the enemy. Back in the black hole, Sarnath attacks Don. Mad with power, Don begins blasting Sarnath with energy beams, tearing away parts of his body. Sarnath tells Don that if he can see everything, then to take a look at the trouble his friends and family are in. Seeing his brothers and Ninjara in danger is enough to momentarily disorient Don. Sarnath takes advantage of the opportunity and seizes the Turnstone. Able to see for the first time in years, Sarnath decides that he must make the necessary sacrifice and teleports Don back to Nova Posse’s ship. Sarnath deduces that the Sons of Silence were using their telepathy to trick Don into possessing the Turnstone for them, though the black hole and the war it started was an unintended side effect. Never the less, Sarnath teleports them away to an unknown location. Sarnath then destroys all the Imperial ships out in battle, teleporting their pilots back to Mazool’s HQ (Mazool swearing vengeance on Nova Posse). Finally, Sarnath collapses the black hole, ending the whole ordeal. Onboard Nova Posse’s ship, Rave recovers from his injuries as Leo sees to Don. Don explains what went down in the black hole and laments that by collapsing it in on himself, Sarnath has been sealed outside of the universe forever. Don then joins the sorrowful Qark in mourning the loss of their dear friend. The Gang of Four drops down from the mouth of the Mutanimals’ volcano HQ and immediately begin attacking. 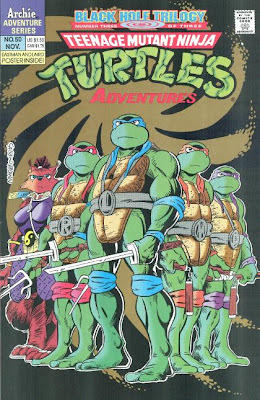 Future-Raph tells Future-Don that his “history books” were wrong and they arrived to late to stop whatever they came to do. As they attack, the Gang of Four introduce themselves. Lynch repels down on a rope, swing-kicking Jagwar in the jaw. While firing an assault rifle with one hand, Fist launches his other, uh, fist on a grappling cable from his arm, nearly knocking Wingnut’s block off. 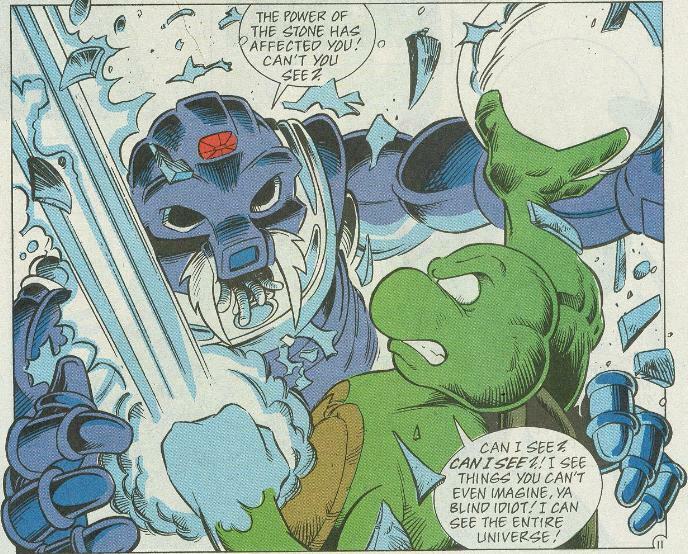 Dead-Eye blasts Future-Raph with his vertigo ray, disabling the Turtle. Finally, Waster removes his fake human mask, revealing a frightening, toothy robotic face underneath. Dreadmon nails Waster in the head with a bag of cement, causing the cyborg to accidentally blast open the hatch to the sea. 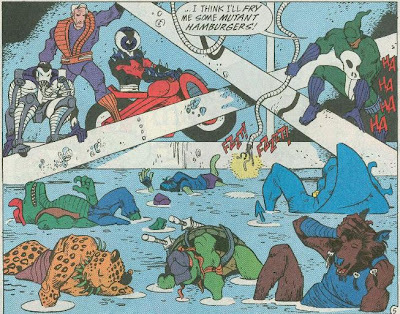 With the Mutanimals and the Turtles down for the count thanks to the high-pressure blast of sea water, the Gang of Four take to higher ground. Lynch grabs a live wire and prepares to dip it in the water, electrocuting the mutants. 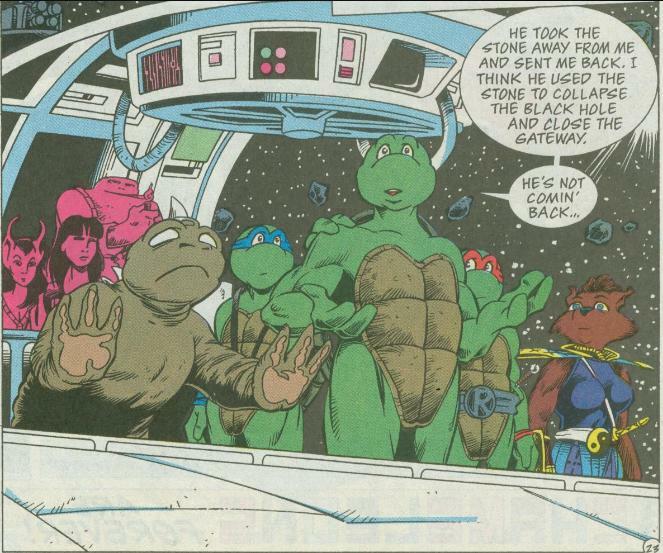 *This story is continued from TMNT Adventures #49. 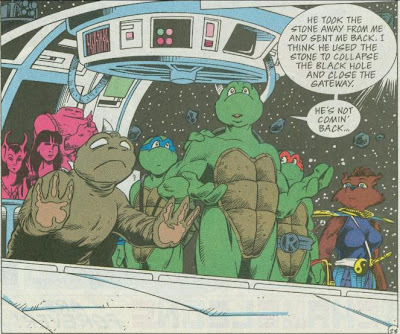 The story continues in TMNT Adventures #51. *As a bonus, this issue contained a full-color, removable poster by Kevin Eastman and Peter Laird. It also included a public service announcement pin-up, “Recycle your old toys”, by Chris Allan and Ryan Brown. “The Black Hole Trilogy” concludes and hits a rather somber note along the way. For a dude that was only in four issues total, Sarnath was a surprisingly strong character for having such a short shelf life. I think it helps that he was built off earlier story elements in the series and contributed to a much deeper mythology; just by existing he really added a lot of consistency and world building. And for a guy who has had things so rough his entire existence (being a slave, then having his eyes stolen, then losing his eyes forever, then getting eaten by a black hole), he seemed to take the universe shitting on him in stride; a very likeable quality. So despite having only been around for four issues, his sacrifice still retained enough emotional weight to keep him from feeling like a “red shirt” type of character. The exact scheme that the Sons of Silence were hatching remains a little muddy. So they wanted the Turnstone for themselves, but couldn’t use it, so they tricked Donatello into using it for them by controlling him telepathically? But if they didn’t want to create that black hole, then what was their ultimate goal? The idea of the blind Sarnath being the one to obtain omniscience and make the necessary sacrifice had a nice bit of tragic irony to it; he finally got to see again but only moments before his doom. As for the space battle at Stump Asteroid, that aspect of the action kind of fell apart with this chapter. Nova Posse’s assault on Emperor Mazool was pointless; they retreat as soon as they get there. What were they hoping to accomplish? There’s a space battle going on, but it’s almost background noise to the narrative inside the black hole; you don’t even get to see Cudley joining the fray. The Turtles and Nova Posse just sort of hang along for the ride while Sarnath sews the conflict up with his magic 8 ball. And man, was that bit where Mazool swears vengeance on Nova Posse corny as hell; like Murphy (Clarrain) was trying to set up the worst spin-off series imaginable. Chris Allan was really firing on all cylinders with the art in this issue. Though the Eastman/Laird poster obscures it (I don’t want to remove the thing), that two-page spread of Sarnath obtaining omniscience and his spectral figure hovering over the black hole and the spaceships is fantastic. And he really deserves credit for all the scenes taking place inside the empty void of the black hole. There are no backgrounds in there, just white space, so the pages rely strictly on the energy and expressiveness of the characters. And Allan totally pulls it off. As for “Megadeath”, we get a page wasted on recapping the last two segments and then four pages to move things along. The Gang of Four are pretty terrible villains, or at least they’re just really hammy. The whole bit where they show off their unique powers while awkwardly announcing their names and personalities felt so… so… Chris Claremont. And I’m sorry, but Lawson totally blew the reveal of Waster’s cyborg face. There’s this huge build-up to it, like it’s going to be this shocking, horribly grotesque atrocity that’ll startle the reader as soon as they turn the page… and it’s just this uninspired, generic robot head with tortilla chip teeth and a pointy tongue. I don't have much to add to this review other than that this cover is one of my all-time favorites of the series! It's just so iconic (even if it isn't terribly indicative of the issue's contents). Mine never came with the poster. I've always been curious as to what it looked like.